OKLAHOMA CITY – Silvano Alves had his left leg up against the back wall in the deep corridors of Madison Square Garden as he stood next to Adriano Moraes four weeks ago in New York. Moraes was leaning against that same wall, intently listening as a bewildered Alves tried to make his way through the smoky haze in his bull riding brain. The only three-time World Champions in PBR history were amidst a conversation about Alves’ struggles for the last three-plus years. Alves reached out to Moraes earlier in the weekend after continuously spinning his tires inside his own head. The decision came following a separate conversation Alves had with his wife, Evelin. Alves had been studying video of his recent performances and comparing it to his World Champion contending years. He knew things were vastly different since he fractured his left hip in 2015 in Nampa, Idaho. He had since made a full recovery from the surgery, but he mentally had yet to return to his prior self and noticed some bad habits in his riding. Alves previously reached out to his friends in the locker room, but none of them could give him the honest feedback he knew he was searching for. Maybe he physically had started to change up his fundamentals some, Alves thought. Alves had a pretty good understanding of what was wrong, but he knew he was struggling to ride bulls away from his hand like never before. “I tell Evelin I need to find someone to help me figure this out,” Silvano admitted a week later in Chicago. “I tell my friends, but they all respect me. They feel they can’t explain to me because of my (world) titles. They are scared to tell me. They don’t say, ‘Silvano, you need to do this. Silvano, you need to change this.’ They just say some bulls buck really good and some bulls are hard. They can’t tell me exactly. So on that rainy afternoon in New York City, two of the best bull riders in the history of the sport got back to the basics. Moraes listened before nodding his head a few times. Moraes then patted Alves on the shoulder and pointed down at the younger bull rider’s legs. The 48-year-old then pushed his own knees inward and pinched, throwing his free arm into position. Alves had believed he was struggling to ride bulls away from his hand because he was failing to lock his left knee (the same side where he broke his hip) inside a bull’s shoulder and, subsequently, was struggling to ride bulls to the left and away from his hand. Moraes reassured Alves that his instincts were correct. 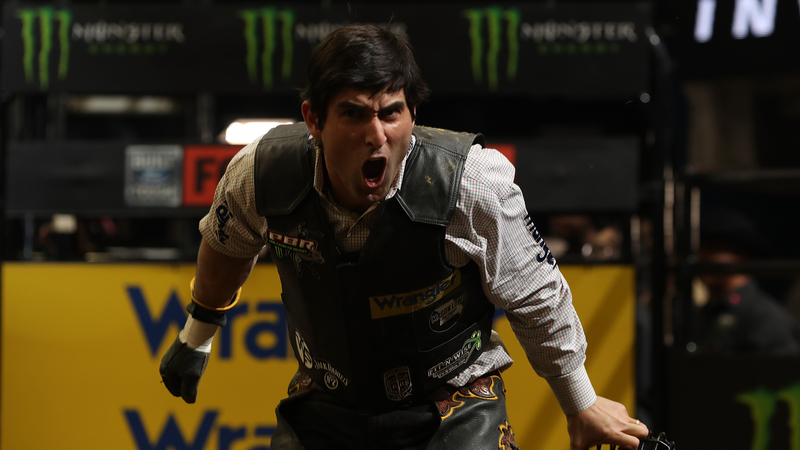 “When you don’t position your knee, holding with your knee, your toes are a little bit out and a little bit up, you don’t lock that door,” Moraes explained to PBR.com. “It is a combination away from your hand of locking that knee and putting your arm in the same position as your knee. It does not have to be right there, but the energy of locking where the bull is going through. Alves was on the right path to correcting himself, Moraes said. Moraes reminded Alves to look back at his 92.25-point ride on Rango in Nashville in 2014. That was an example of Alves at his best. Moraes added, “He was exposing himself and not reaching over the front and inside the spin. The left spin. The bulls were getting underneath his arm and what he needed to do was reach over a little bit more and get inside, recovering with that inside shoulder of the bull going away from his hand. It is hard to describe. It is basically reaching over the front, getting inside a little bit more and riding the bulls inside shoulder a little more. Alves was 90 points once again, and his knees were pinched the entire time, when he rode Freckles Brown for 90 points last Sunday to win Round 2 of the Sacramento Invitational. The 31-year-old then rode his next two bulls – Rocket for 81.5 points and Air Assault for 89 points – to finish the fourth Unleash The Beast event of 2019 in second place. The No. 8 rider in the world bucked off both his bulls – Show Me Homie (2.57 seconds) and South Texas Gangster (3.95 seconds) – Friday night in Oklahoma City, and he will look to bounce back in Round 2 against Udder Brother (0-0, UTB). Moraes does not want any credit for Alves’ turnaround. Alves was already well on his way to solving his errors, but Moraes said he is always willing to talk with a bull rider about his struggles. He was more than happy to chat with Alves in New York, and he was humbled that Alves felt he could be a sounding board. Alves said in Chicago that he was extremely appreciative to have talked with Moraes in New York. The runner-up showing was Alves’ best since placing second at the 2017 PBR World Finals, the same place where he last hit the 90-point threshold (90 points on Catfish John). Alves has shown glimpses of his prior self since his injury. He won the 2016 premier series event in Eugene, Oregon, but he has yet to regain the dominant consistency of the once 8-second machine. During his world title years, he was churning out rides at a 60-percent rate. In 2018, Alves finished a career-low 32nd in the world standings with a 39.13-percent riding average. Moraes believes Alves can still win a record-setting fourth world title. He gives full credit to Alves for trying to improve and get back to where he once was. Moraes believes Alves wants to get back to being at the top of the game, and he expects it to happen. Alves is putting the work in. “Two years of struggling,” Moraes said. “The first year he was struggling with pain and the second year was just riding (problems). He had a knee that could not kick as much and it created bad habits. He lost the ability of locking the gate. As I told everybody long ago before he came over, he will be a four or five-time World Champion. Alves is not talking about world titles just yet, but he does believe he has what it takes to stay inside the Top-10.